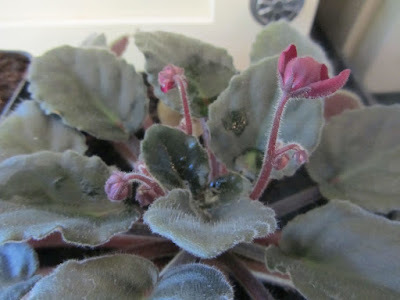 creative savv: Remember that leaf-cutting I took from my African violet plant? Remember that leaf-cutting I took from my African violet plant? Well, here's one of them! Fall of 2013, I took 4 leaves, plunged them into soil, and kept watered. 2 leaves developed into full-blown plants. And one is in bloom right now! Both of my new plants are ready to give as gifts, at the next opportunity. Well, the excitement continues (I lead a remarkably exciting life, don't you think?). I plucked a cluster of Christmas Cactus leaves off of my one plant, and plunged it into soil, keeping it watered for the last few months. 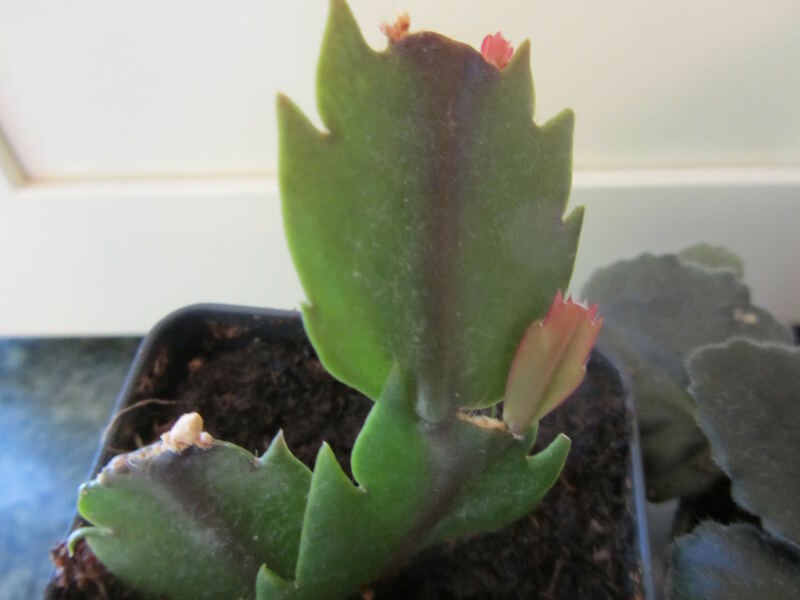 Do you know how to tell if your Christmas Cactus leaf cutting has developed roots? When you see some reddish or pinkish new growth at the tip of one of the leaves, that's a sign the roots have begun. I'll be babying this little plant for the next year and a half, and by the holidays of 2016, I should have a full-fledged, and in flower plant to give as a hostess gift. These sell for $10-15 per plant in grocery stores during the holidays. I think I'll take another 2 or 3 cuttings this week, and get more plants on their way, for holiday gifting. It's so much fun starting new plants. Unfortunately, that's something I don't do because the cats seem to eat anything green whether it is good for them or not. They ate other plants even when we grew grass just for them. And I could go on and on about how they defeated the barriers I had to keep them out of the seedlings I was growing. I guess it's plants or cats, and I've chosen cats. Is there a trick to getting Christmas cactus to bloom when you want? When I've had them, they've always been in bloom during the spring or summer. Hmmm, I wonder if what you had was Easter Cactus. Easter cactus begins bloom in February. But in any case, bloom is initiated by light and temperature. When I find a "good" spot in the house for a type of plant, I stick with it. And the spot for my original Christmas Cactus must get just the right light and temperature requirements for late fall bloom. I have the same situation with my African violets. When I try to keep them in a different place in the house, they don't bloom as well. I have a friend with cats and dogs, and she has the same problem. She only has a couple of places where she can have live plants or bouquets of flowers -- one the windowsill in the kitchen (has too many obstacles for the cats to try ad get to anything there, faucet, dish soap, sink, etc), and the other on top of a very high cabinet, too far for the cats to jump to. Kind of limiting, I agree. so I was reading about the differences between Christmas, Thanksgiving and Easter Cactus. In addition to bloom-time, the leaves on all 3 are slightly different from each other. The edge of the leaves of Christmas Cactus have smooth, rounded edges. The edge of the leaves of Thanksgiving Cactus have the pointy edges. And the edges of the Easter Cactus have bristles on the edges. So, I believe that what I have is actually a Thanksgiving Cactus. It does begin blooming in fall, and goes all the way to New Years. I do sometimes get more blooms late in winter, too. One other interesting fact, none of them are desert plants, but are tropical in origin. Wow, that's hard-core "planning ahead" but how fortunate for the future recipients. And what nice gifts for so little money and effort. Brilliant, once again, Lili! I think it's part planning ahead, but also just part tinkering sort-of-fun. So, I'd do it any way. But I get a bonus in being able to give a plant away. I'll be shopping garage sales this summer for nice Christmas-y baskets to put the Christmas Cactus gifts into. My mom did that and I had the most amazing house plants as a student. None of my mom's plants survived for me though one of my SIL has a gorgeous Hoya plant from my mother that she has offered me cuttings. My Mom would frequently start aloe plants..Have you tried this plant to propagate? Speaking of planting I have wanted to try asparagus , shallots and garlic. All which I purchased yesterday for 75% off. The green onions in a planter came back this year so I am thinking I may have even more success with these bulbs in the ground. I've never tried aloe before, but would like to. I'll have to ask around with friends if anyone has a plant I could have a leaf from. Aloe would be nice to have. Oh, good deal on the asparagus, shallots and garlic. I do shallots and garlic every year. I dig them up in mid to late summer and choose the best looking bulbs to save for the next season. In the PNW, you can replant the bulbs in October or hold them in the fridge over winter and plant in late winter/early spring. Asparagus doesn't like our soil. It may be too wet here in winter. I've tried a couple of times, starting from seeds. I'd like to build a new bed, just for asparagus, and see if I could get it to perform here. Fresh asparagus sure would be nice to have each spring. The African violet looks really nice! My thumb isn't very green but we have quite the aloe plant that my husband started from a cutting. African violets seem to like me. Most of my other house plants eventually die (with exception to ferns, those make it through my neglect). Good job to your husband on the aloe plant! I'm definitely going to have to ask around for a leaf from someone. I miss having plants in the house but it is worth the sacrifice. We travei south for the winter and boondock in Arizona and California. By turning the heat off and suspending telephone and Internet we save enough money to afford staying for about 4 to 6 months. We live in a place in the country so we have lots of plant life around us. I still enjoy indoor plants and never tire of them. Good planning for gifts. I too stock pile homemade gifts and plan for events. Thanks for keeping the inspiration alive. This is one of the reasons we don't keep hens. It would limit travel. Your comment is the second time in 2 days that someone has used the term "boondock"! Previously, I'd not heard that term in that context. Interesting! Anyway, what a great winter travel plan you have! Do you RV? I had never thought I'd want to have an RV, but lately am considering it, and doing what you and your hubby do. Do you also suspend some of your car insurance over winter? I don't know if insurance companies still allow this, but you used to be able to "garage" a car for winter, and not have it covered on insurance for a few months. I'm not too great with indoor plants, so some of my favorite house plants are actually fakes. Yes we RV. We bought a used 5th wheel for $4700. It is only 23 ft long but good enough for us and we have friends that come and visit for 10 day. We don't cancel our insurance as we only have a truck and motorcycles. We can't t cancel the insurance on the mcs but we do take one down with us. I never thought I would like it. It is so relaxing and everyone we meet is so nice. We are able to get super fresh veggies and fruit for reasonable prices so it ends up very inexpensive. Good luck trying out RVing. It is a step learning curve but there are a lot of blogs to help you out. That is steep learning curve. Great ideas for inexpensive gifting! I haven't done those particular plants, but in order to put in the above-ground pool (purchased on clearance last fall for $150 as opposed to the normal $499 price), we had to move two of my garden beds this year. One contained a sage plant I've had for years, so I took cuttings and attempted to root them. One was doing well so I planted it in a new location and it appears to be thriving! Saves me money plus I know it's a variety that should do well in my yard. Oh, good save on the sage plant! I didn't know you could root sage so easily. I will remember that, as I have a sage bush that has overgrown it's spot, and I wish to continue growing sage, but don't want to have to buy a new plant or start from seeds, again. After looking online, I cut decent-sized sprigs from the sage plant, put them in jelly jars of water, and stuck them under the grow light, as I had other plants under it already (starting my garden seedlings). I'm sure you could also put them in a window with good light. my christmas cactus was started from 1 little segment and it took years to flower. :) It is a beast of a plant now. But I think I waited 15 years before it became much of anything to look at. It grew so slow, painfully slow, for all those years. Now I keep it outside during the summer and it looks so happy and big. I started it in water, a single cutting over 10 years ago. It just takes time and persistence to get a Christmas cactus plant from a cutting. It blooms with the most gorgeous salmon colored flowers I have ever seen. I love it. I have read that Christmas cactus won't flower until it's roots have reached the size of pot it's planted in. I've also read that a little bit of fertilizer helps these plants along. Mine is light pink-- not as showy as some of the other colors, but pretty nonetheless.